Well, I did a live blog for Game 2, and the Phillies lost a game they could have won, so I am not doing a live blog tonight. But, I may (or may not) check in from time to time with comments on the game. So, let us start now, about 15 minutes from game time. 7:43: If you had offered me a deal when the Series started that the Phillies would split the first two in Yankee Stadium, I would have jumped at it, knowing just how good the Phils are at home and trusting in that. However, the more I’ve thought about it, the more I’m pretty jumpy about this Series right now. With CC looming tomorrow (against Joe Blanton), if Cole doesn’t come through tonight and get the Phils a 2-1 lead, we could be facing an elimination game as early as Monday night. I’ve said from the beginning that we cannot go back to Yankee Stadium needing both games, which means that the Phils need, at least, 2 out of 3 here at home this weekend…or else. And, as I said, tomorrow’s game has a pretty big pitching advantage for the Yankees, so tonight has become HUGE. Yes, I’m very nervous. That poor towel might be in for some trouble tonight. 7:47: In another superstitious move, I decided to change my game beer. Last night I was enjoying a Samuel Adams Blackberry Wheat, but tonight I just went out to find something different. And, in a stroke of fortune, I found one of my all-time favorite beers (which is somewhat tough to find), Samuel Smith’s Oatmeal Stout. So, that was fortuitous. And, I played tennis today and had SIX balls that hit the tape and rolled over, so I have been incredibly lucky, on multiple levels today. Let’s hope that it continues with the Phillies and let’s hope that I haven’t used it all up on stupid things like tennis and beer. 7:38: Well, we are just minutes away from the first pitch of Game Two in the Bronx. What an amazing pitching performance by Mr. Lee last night–one of those monumental performances that we, as Phillies fans and probably most baseball fans, will never forget. Now, as we enter Game Two, it can almost be characterized as a “must-win” for the Yankees. The Phils have already accomplished their “goal” of a split in New York, and it would be devastating for the Yanks to go to Philly needing 2 out of 3 just to stay alive in the series, especially since Mr. Lee looms in one of those games in The Bank. 7:42: Already some really interesting lineup selections on both sides here tonight. First, the Phillies have decided to go with Matt Stairs at DH, with Ibanez out in LF. This is not that big of a surprise, especially considering Greg Dobbs is unavailable with the flu. But, there are a couple big decisions on the Yankees side that I would not be happy about if I were a Yankee fan. First, is going with Jose Molina, again, to catch for AJ Burnett. I think it’s really stupid to take a middle-of-the-order hitter out of the lineup, replacing him with a guy who hits like a pitcher, just because the pitcher and catcher can’t get along. That is ridiculous in the highest level of professional baseball. Secondly, and this one I think is just a clear example of Joe Girardi overmanaging. He is benching Nick Swisher for Jerry Hairston, Jr. I know that Swisher is struggling, but he did hit 29 home runs in the regular season, and it’s not like you’ve got a stud just waiting to fill in. It’s Jerry Hairston, Jr! Yes, Joe, you went to Northwestern, you’re smarter than me, I get it. Sorry, for questioning you. 7:48: I think one of the big keys to this game tonight, for the Phils, is to try and win the 7-inning game. Mariano didn’t pitch last night, so with the off day tomorrow, you can put money on the fact that he’s looking at a 6-out save tonight. So, the Phils need to, at the very least, play the Yanks even through 7 because there might not be a comeback opportunity against The GOAT closer. So, we are mere hours away from a MOMUNENTAL clash of titans in the War on the Jersey Tur npike (“Turnpike Tussle,” maybe?). Forget being a fan of either team, this is going to be great for the baseball fan. These two are clearly the two best teams in baseball, and they have styles of play that create excitement for the casual fan AND intimate strategy for the serious fan. I almost wish I wasn’t a Phillies fan, so that I could enjoy this each game without my every nerve being shot for four straight hours…ALMOST. But, let’s be honest, it is absolutely phenomenal to root for this Phillies team. They are exciting; they play hard on every play from Spring Training to the World Series (as noted by Raul Ibanez when he got here); and, they are just flat-out good. The defending champs (and, yes, Boot, the greatest team in the history of the National League–more on that later, probably after the Series) VS the greatest sports franchise in the history of North America. So, let us get down to it, with this World Series Extravaganza, with random notes, things to look for, and overall analyses of everything I can squeeze into this post. I’ve been working on this for the better part of three days, so it might be a bit long. The reigning Champs vs. the most storied franchise in sports. The 2009 Fall Classic might be the most anticipated sporting event for Philly sports fans in a generation. In the latest BSB Podcast, Bry and Doogan preview the series, discussing how the teams will set their rotations behind their aces, giving a position-by-position comparison of the position players, and, of course, predicting who will come out on top. Check out the podcast at http://broadstreetbelievers.podbean.com/. LATEST: As most have probably heard by now, Brett Myers has replaced Miguel Cairo on the Phils roster, as the Phils go back to 12 pitchers. I’m fine with keeping Bruntlett over Cairo, as he gives you better speed and defense. Meanwhile, the Yankees have also added a pitcher to their roster to go to 12. Hard-throwing righty Brian Bruney is on the roster, along with pinch-hitter Eric Hinske, who Phillies fan remember well, as he struck out to end the World Series last year as a member of the Rays. The Yankees left catcher Francisco Cervelli off the roster, which might signal that Jorge Posada will catch A.J. Burnett in Game 2. I know the only reason that Cervelli was on the roster for the first two rounds of the playoffs was so they could hit for Molina with Posada late in the game and still have another catcher on the bench. With no Cervelli on the roster, it will be interesting to see if Joe Girardi still goes with Molina in Burnett’s starts. So, What Are We Rooting For This Weekend? The Phillies didn’t need this weekend for Games 6 or 7 of the NLCS; they are already in the World Series. The Eagles don’t get a chance to make up for their debacle in Oaktown last week until Monday night against the dysfunctional Deadskins. The Sixers don’t tipoff until Wednesday night in Orlando. So, what do we Philadelphia sports fans root for this weekend? Well, we can always lean on the ole standbys of “whoever is playing the Giants [Arizona] or the Cowboys [Atlanta].” That is always a good time. Yet, with the Phillies #1 in the city and awaiting their shot at history, the ALCS clearly has the largest implications on the Philly sports scene. And, with the Angels exciting win in Game 5, sending the series back to New York, under very iffy weather conditions, many things are in play. But, just what do we really want? Rainout Saturday, Angels win Sunday and Monday: If we are really looking at what is best for the Phillies, there is one player that we are clearly rooting for this weekend–Mother Nature. A rainout this weekend would be phenomenal for the Phightin’s. An Angels win in a Game 7 on Monday would be absolutely perfect for the Phils. The Angels may use even use Lackey on three days rest if there is a Game 7 on Monday and, although the Halos have a deep pitching staff, having to hold Lackey until Game 3 could be crippling (though, he would be ripe for another Game 7 victory, like he had as a rookie in 2002). Angels win Saturday and Sunday: I had a lot of trouble deciding between #2 and #3 and what I thought would be better, but ultimately, I had to put aside my desire to beat the Yankees and just accept the fact that a WS title, anyway you can get it, is really all that matters. And, I think that as much as I think the Yankees pitching staff completely hinges on the durability of their ace, the Yankees offense is still terrifying. So, I think that anyway we can get the Angels, we should take it. The problem with this scenario is that, if the Angels can get wins from Saunders and Weaver this weekend, they will go to the World Series with their staff ready to go, in the order they would like it. 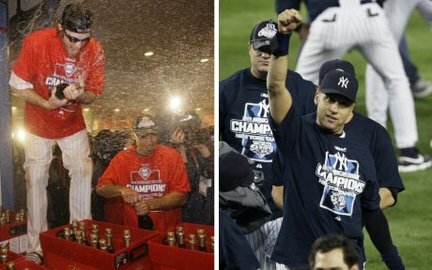 Rainout Saturday, Angels win Saturday, Yankees win Sunday: Like I said, I think this scenario is very close in “preference” to #2. If there is a rainout on Saturday, the Yankees will have to make a decision on Sunday’s starter. Both Pettitte and Sabathia will be ready on regular rest. So, do they throw Sabathia and try and end the series, even though that means that he would be unavailable for Game One of the World Series and lined up for Game Two on three days’ rest (and unable to make three starts in the Series, as they are hoping)? Or, do they throw Pettitte, hoping that they come through and then they can start the WS with Sabathia? Personally, I think it’s an easy call–they should throw Pettitte–and that’s what I think Girardi will do. BUT…that opens them up to a pretty terrible scenario (for them) because if Pettitte doesn’t get them a win in Game Six, Sabathia will have to throw on Monday. This means that he will not be available until Game Three. That would be a HUGE advantage for the Phils–not having to face Sabathia in the first two games in Yankee Stadium. No matter how the Yankees choose to work their staff, if the ALCS is still being played on Monday, the Phils may become the odds-on favorites to win the Series. Angels win Saturday, Yankees win Sunday: Obviously, as I’ve said before, I think the Angels present the easier opponent (though, by no means, an easy one). And, obviously, the extra day that the rain may gift the Phils would be nice. But, if we have to play the Yanks and Mother Nature doesn’t “cooperate” with our plans, just getting the Yankees to a Game Seven would be a GIGANTIC gift from Mike Scioscia to his Philly hometown. Sabathia is going to throw Game 7, which means that he would be unavailable for Game One, and could only pitch Game Two on three days’ rest. And, if he doesn’t throw Game One, there is no way for him to possibly pitch three games in the Series. This would be phenomenal for the NL Champs. Rainout Saturday, Yankees win Sunday: This would, at least, force Girardi to make the decision on starting pitcher that we described in the #3 scenario. Again, I think Girardi will choose to throw Pettitte and save Sabathia, but he might not. And, if he doesn’t, then we get the same advantage as described in #4. Yankees win Saturday: Obviously, the worst case scenario for the Phillies is if the game is played tonight and the Yankees win. In fact, I think that if the Yanks win tonight, it’s better for them than even if they had won Thursday. They will be all set up with their pitching staff, they will have a bit of momentum, in winning at home, and they will not have the week of rust that the Phillies are currently trying to stave off. So, this is bad. All in all, I think that, all being equal, the Phillies would be a decided underdog against the Yankees. I think they would probably be a slight favorite against Anaheim. But, the advantage that the Yankees would have is slim enough so that if, for whatever reason, they cannot throw Sabathia in Game One, their advantage is nullified. So, this weekend, as we watch, we should, first of all, root for the Angels to win the AL Pennant, so we can avoid that stacked Yankee lineup. But, if it has to be the Yankees, let’s see if we can somehow get, instead of a matchup of the past two AL CY Young winning Indian pitchers (Lee vs. Sabathia), we get to face that headcase, AJ Burnett. All of that analysis aside, I really want to face the Yankees because I think we are going to beat them, and that would be awesome! But, either way, let’s go Mother Nature! Okay, let’s talk, for a minute about Uncle Charlie. And, yes, I went the route of a cheeky headline because, well, if anyone deserves it, it is Our Manager. I am not in the position (at work) or mindset (on no sleep because of these stupid baseball games) to speak as eloquently or intelligently as I should about just what Charlie Manuel has done for this Phillies franchise since he’s arrived, but something makes me believe that he would rather have it this way, if it were up to him. Charlie was chosen as the manager of this team pretty much because he was the anti-Bowa. The Phillies made the common sporting “mistake” of choosing a coach/manager for the mere reason that he is the exact opposite of the coach/manager whom they are trying to replace. Larry Bowa was seen as “too fiery” and “too demanding.” Players were seemingly pressured, instead of inspired. The atmosphere appeared tense, not intense. In striving for success, they seemed to do so not for themselves or the fans, but to avoid the wrath of their manager. So, the Phillies brass decided to go another direction. They wanted a “player’s manager.” They wanted a guy who created a relaxed atmosphere. They just wanted to erase the Bowa Era. Like many of the moves that Ed Wade made in his tenure as General Manager here, this move was tunnel-visioned and incredibly simplistic. But, was accidentally ingenius. Charlie did bring a loose atmosphere. But, what he also brought was a demand for respect from the very beginning. Not necessarily from the fans, certainly not from the media, and not even from the front office. The only place he demanded respect is the only place that it matters–in the clubhouse. He, famously, has just two rules–(1) be on time, and (2) always hustle. Everything else is up to the players to take care of. And, honestly, they are adults, that should be enough. And, the key component to this method is that there is no leeway for breaking these two rules–as Jimmy Rollins found out concerning both of them. Now, Charlie is beloved by the fans, exalted by the media, and fully entrusted by his front office. And, the players, well, they have never changed. They love him. They play hard for him. They believe in him. And, most of all, they respect him, just as he respects them. Charlie is a man from the rural Virginia countryside, and nothing in his speaking habits or physical mannerisms does anything to veil his roots. He is slow-speaking and a bit bumbling, at times. He despises public speaking, but he is a proud man, whose intelligence and wit were so often lost on the fast-paced Northeastern fanbase of Philadelphia. But, the beauty of Charlie is that he has no shame in the way he speaks and asks only that he be judged on the decisions he makes, not on how he explains them in the postgame press conference. The only time I have ever seen him visibly upset is when he was openly mocked by a member of the Philadelphia media not for his decision when to remove the starting pitcher, but for his apparent lack of the “correct” words to explain it. 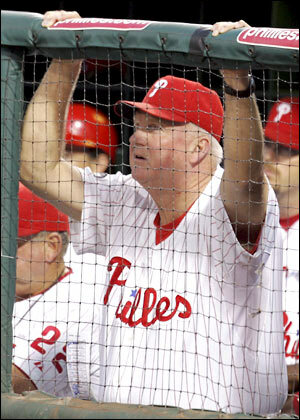 Charlie Manuel is now the leading man for, arguably, the best team in the 130+-year history of the National League. The Phillies have won five consecutive playoff series and done so without ever trailing, in games, going an astouding 18-5 in the playoffs. This year, they handily defeated two teams that combined for close to 190 wins this season, and they are doing it with a patchwork bullpen. Charlie has simply and undebatably OUTMANAGED his opposing manager is five consecutive series, including two straight NLCSs against Hall of Fame manager Joe Torre, a division series against the likely NL Manager of the Year, and a World Series against the media darling and so-called “genius” who likes to quote Nietzsche and Whitman (all the while completely botching simple baseball strategies and spinelessly and cowardly ripping his own home town). And, now, Charlie is four wins away from standing on another parade float in front of millions of Philadelphians on Broad Street, all chanting his name. And, it could not have happened to a more humble, more genuine, more compassionate man. When he broke down last year in talking about his late mother, it was one of the most human moments I have ever seen in sports. As much as I love to see Jimmy Rollins in goggles, I will tell you honestly that the one sight that makes me the most happy in seeing the Phillies win is the look on the face of Our Manager. He is so happy, so full of life, so proud of his team. Charlie Manuel reminds us that these sports appearing live on our big screen TVs from thousands of miles away in front of 50,000 paying customers are played and managed by real people. Charlie Manuel is one of the greatest I have seen at unveiling the human side of these actors performing our country’s greatest dramas. Thank you, Charlie, for your wisdom, your humility, and your simple joy in what we so often forget is just a game. Just a game from which simply playing makes us happy–and winning makes us legendary. 6:40 PM: We’re about 90 minutes from the start of Game 5, and the champagne and ice have already been shipped to Citizens Bank Park in anticipation of the Phillies winning their second straight National League Championship. Joe Torre’s Dodgers have their backs against the wall in an elimination game on the road, while the Phillies confidence must be at an all-time high following yet another how’d-they-do-that win in Game 4 on Monday night. The Phils will send Cole Hamels to the mound, just as they did in the Game 5 clincher of last year’s NLCS against these Dodgers. That’s about where the similarities end for Hamels. Last year at this time, he was the most dominant pitcher on the planet. So far this October, he’s probably been the Phils’ least reliable starter, coming into tonight’s game with a 6.97 ERA in his first two games. This is definitely the least-crucial game the Phils have had in the playoffs, but if Hamels could come out and dominate the Dodgers, it would not only end this series, but would be a fantastic boost for the pitching staff heading into the Fall Classic. In last year’s Game 5, Hamels allowed one run in seven innings. Let’s hope for a repeat performance. The Dodgers counter with Vicente Padilla, who dominated the Phillies in the Dodgers’ Game 2 win last week. It’s well-documented that Padilla is not the most mentally stable person in the world, so it will be interesting to see how he reacts to adversity on enemy territory in Philly. The Phillie hitters all know exactly what to expect from him now, so maybe they can put some runs on the board early. 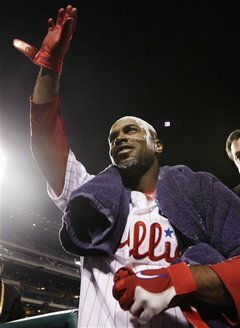 Maybe there will be a repeat of last year’s Game 5, when Jimmy Rollins led off the game with a home run. 8:08 PM: OK, a note on superstitions here as the game gets started. First off, I’ve worn the same Phillies t-shirt for every playoff game over the last two years. At this point, I’m not sure how much money someone would have to offer me just to have me NOT wear this shirt during a game. I’m pretty sure it would be quadruple-digits. Second, I’m enjoying some Dogfish Head “Punkin Ale” with the game tonight. I also had this beer on Sunday night during the 11-0 win, so that’s a good sign. I made a small misstep though at the start here. I poured the beer into a regular pint glass, instead of my Phillies mug given to me as a groomsman gift for Bry’s wedding last year. I’ve made the switch to that mug now, and we’re all set-up for victory in my apartment. 8:19 PM: The Dodgers stick with the same lineup they used in Game 4 and Andre Ethier comes through with a first-inning homer. Buck Martinez said that Hamels had “good command” of his fastball one pitch after he clearly missed his spot and one pitch before he gave up the homer on a 1-2 fastball in the middle of the plate. Hamels didn’t want to throw the change-up to Ethier for some reason. Ethier kept fouling off fastballs before finally hitting one out. 8:34 PM: I guess it was a bad sign! The Dodgers decided they don’t want to pitch to Ryan Howard anymore, but that’s not gonna work against this offense. Padilla ran a deep count against Jayson Werth, then put a series of fastballs in the middle of the plate, before Werth finally pounded one over the right-field fence for a three-run bomb! Now we need Hamels to get the job done. 8:41 PM: Hamels gives up another solo shot to a left-hander in the 2nd. As the announcers said, lefties are now 9-14 with 3 homers against him in the playoffs. I wonder if it’s because he’s not throwing enough change-ups to them. A lot of times, lefties are hesitant throw change-ups to left-handed batters, but Cole has to be an exception. That pitch is what makes him so great, and if he makes himself just a fastball-curveball pitcher, he’s going to get hit. 8:50 PM: Pedro “Pete Happy” Feliz leads off the 2nd with a homer! Looks like we could be headed for a shoot-out in this one. When they show the close-up of the Dodgers’ right-handed hitters, there’s a fan over their shoulder with a sign that says, “This guy stinks”. Pretty funny. 8:58 PM: Hamels ends a 1-2-3 3rd inning by striking out Ethier on a…change-up. He needs to keep going to it like that. 9:17 PM: Heading to the bottom of the 4th, and maybe it won’t be a shoot-out. Neither pitcher has allowed a hit since Feliz led off the 2nd with that homer. Though with Hamels already at 76 pitches, the bullpen will be in there before too long. 9:28 PM: A single and double from Werth and Raul Ibanez to start the 4th put the Phils up 5-2 and chase Padilla from the game. You could argue that the Dodgers made a mistake leaving Padilla in the game after the 2nd inning. It was pretty obvious that he didn’t have it tonight and in an elimination game when you have “all hands on deck” in the pen, you can’t afford to see if the guy will pull it together. I’m a big fan of quick hooks in the playoffs, especially when your facing elimination. 9:50 PM: Joe Torre may have left Padilla in the game too long, but he managed the 4th inning in a pull-out-all-the-stops manner, bringing in his main set-up man, George Sherrill. Sherrill couldn’t prevent further damage though, hitting Shane Victorino with the bases loaded, stretching the lead to 6-2. Rick Honeycutt has really been wearing out the phone to the bullpen already. And speaking of Honeycutt, seeing him makes me feel really old. I vividly remember watching him pitch, and now he’s pretty damn old looking. 10:00 PM: Another underwhelming outing from Hamels comes to an end, as he gives up a pinch-hit homer to Orlando Hudson and a double to Rafael Furcal. Hamels goes just 4.1 innings, gives up 3 runs (and is responsible for the runner on 2nd), and will get a no-decision for his efforts. J.A. Happ is on in relief. 10:17 PM: Clayton Kershaw, the scheduled Game 6 starter, is on in relief for the Dodgers. Win or lose now, the Phillies have accomplished something. The Dodgers will most likely be left choosing between Hiroki Kuroda and Chad Billingsley for the Game 6 start, if they manage to get there. 10:21 PM: In response to Bry’s comment below (#5): After Manny didn’t run out of the box on that play, I was left wondering if he’s really worth all of the money you have to pay him. I know when he’s producing like he did last year, he is worth it, but he can’t be that dangerous with the bat all the time. He’s a total liability defensively, he can’t run, he doesn’t care in the least about winning. I think the guy’s pretty hilarious, but I wouldn’t want him on my team. 10:37 PM: Helluva job by Chad Durbin for 1.1 innings. He hasn’t given up a run in his 5 appearances now in the post-season. We’ll take everything we can get from this bullpen. 10:45 PM: Not that he’s the only guy on this team you could say this about, but the legend of Shane Victorino grows a bit more with big 2-run homer to put the Phils up by 5 through 6 innings. For the Dodgers, facing elimination and a 3-1 deficit in the series, that had to be such a deflating hit. A five run hole feels incredibly different than three. The Phils can taste that NL pennant now. But still 9 outs to get. 10:47 PM: And, not to get ahead of ourselves, but the Phillie bullpen is STILL not completely settled and figured out, so how these guys perform in the rest of this game could determine how they’re used in the World Series, you know, if we get there. The way Park has been pitching, he could move into a more important role next week. 11:07 PM: Ho hum, just another LONG home run by Jayson Werth. 9-3 Phils heading to the 8th. Interesting that Charlie is sticking with Park here in the 8th. Hard to argue with that. I’d honestly like to see Lidge pitch the 9th no matter what. I just want another look at him pitching a whole inning before we head into the next series. 11:18 PM: OK, this is pretty much what I was talking about with the bullpen. Madson comes in and inexplicably walks Manny, with a 6 run lead, then gives up a single to Kemp to score a run. If we win this game (I’ll keep saying ‘if’), Park should move past Madson as our main set-up man. He’s clearly out-pitched him throughout this series. 11:29 PM: Madson pulls it together and gets out of the 8th with a 9-4 lead. 3 OUTS from the pennant. I’m sure the Yankees and their fans, after a 103-win regular season and cruising through the playoffs so far, are feeling very confident right now. But they have to be fearing this Phillie team a bit. There will be plenty of time to ponder that series if it ends up coming, but no team can have too much confidence going against these Phillies in a playoff series. Or at least they shouldn’t. 11:52 PM: NL CHAMPIONS!!!!! AGAIN!!!!!!!!!!! YES!!! A never-say-die attitude that makes them so much better when the game/season is on the line. An affable, but underappreciated manager who is a true baseball “lifer” and seems to be enjoying this ride as much as anyone. As Doogan mentioned the other day, he really is a guy that you want to succeed. And, they’re not doing it “despite” him or even “for” him; this team succeeds “because” of Charlie Manuel. An incredible work ethic, personified by its best players. The old sports adage that says that a good team is one where their best players are also their hardest workers. Chase Utley and Ryan Howard are absolute workaholics. It’s well-documented that Utley is among the most prepared hitters in baseball. His film study routine rivals Peyton Manning’s. And, think about Ryan Howard. He was the MVP in 2007 and the runner-up in 2008. He has earned himself back-to-back record-setting arbitration contracts. His offensive prowess, alone, will make him more money than he can fathom spending in his lifetime. And, then last October, he leads his team to a World Series championship. So, what does he do to celebrate this offseason? He is already a World Champion, an MVP, and a ridiculously wealthy man. He has the best power numbers to start a career of anyone who has ever played. But, instead of saying “I’ve made it; I’m at the top of my profession,” he decides to use the offseason to improve the only two things anyone has ever questioned about his game–his weight and his defense. That is the sign of a true professional. And, not only do we fans want to see the best players working the hardest, but we also need an attitude. This team has that, too. Other teams hate Shane Victorino, and for all the right reasons. Jimmy Rollins has the ultimate “F-you” attitude. Even Utley, who is quiet and seemingly mild-mannered, has an intensity that manifests itself when he is challenged. Plus, you throw the wild-card of Pedro Martinez into the mix, and this team has the perfect combination of “good guys” and “hell-raisers” to be both professional and unintimidated, at the same time. They have character. The only guy who has even aroused any steroid discussion is injured relief pitcher, J.C. Romero–who was never caught for anything related to steroids. He was suspended for taking something on the banned substances list, but it was not anything that is even remotely linked to a steroid of any kind. This team is clean. And, they are just good. And, finally, they have fun, and they really band together. Most of the team is home-grown, from the farm system. Again, as Doogan, mentioned, I thought the same thing about Howard talking about Ruiz running faster than he’s seen since Rookie Ball in Clearwater. These guys have been together every step of the way. They are not hired mercenaries. They are brothers. Even Chan-Ho Park has said that on all the teams he has even been on since coming to the States from Korea, he has never actually felt like a part of the team…until now. He felt like he belonged from Day One. So, now, we are one win away from a World Series date, probably with the notorious Bronx Bombers. The “Best Team that Money Can Buy,” the team with, by far, the largest steroid cloud over the past decade. The team that fired their manager after TWELVE consecutive playoff appearances. The team that spent a half-a-billion dollars this offseason. This could be a lot of fun…if we get there. Okay, I really do not understand the fact that Pedro looks like he will be the Game Six starter. Maybe it’s not a final decision because, obviously, the Phillies are hoping there won’t a Game Six, but it makes absolutely no sense to throw Pedro and not Cliff Lee. We all know that anything can happen in a Game Seven, so you have to do everything in your power to avoid one. And, Lee, having pitched Sunday, would be on regular rest for Friday’s Game Six. PLUS (and this is a big one), IF the Phillies do win this NLCS, the World Series starts on Wednesday night. This means that if Lee pitches Friday in Game Six, he will be ready, on regular rest for Game One. But, if the Phils throw Pedro and lost, and need Lee on Saturday for Game Seven, he won’t be ready until Game Two on Thursday. Again, I haven’t found anything from the Phillies brass saying that it won’t be Lee, so I hope that they see the logic as well. Plus, wouldn’t you rather have Lee in a Game Six, when saving the bullpen is important and then throw Pedro in a Game Seven when it’s “all-hands-on-deck?” I know I would. But, let’s not think about any games back in LA (unless it’s in Anaheim), especially a Game Seven. I think it’s funny that the Dodgers are going with Vicente Padilla in Game Five. Is Torre desperate? And, if so, is Vicente Padilla really the answer to desperation? How good has Carlos Ruiz been? To get that kind of production out of the bottom of the lineup, with this STACKED order, is invaluable. All through these playoffs, I have heard all the pundits talking about Brad Lidge, and I have never, ever bought into the “Lidge is Back” theory…until Monday night. I did not see what the “experts” were seeing. Yes, he was three-for-three in save opportunities, but I thought all three were shaky…until Monday. His performance, albeit against just two hitters, was STARKLY reminiscent of the 2008 version. Both hitters were fooled by slider and unable to hit fastballs. He looked dominant. I am sick of Phillies fans complaining about the “bias” of the national announcers. And, I am just as sick of non-Phillies fans feeling they have to defend Chip Caray and Ron Darling. They are not biased, they are just really, really bad. I know I said this before, but I thought Brian Anderson and Joe Simpson were terrific in the first round, am I crazy? But, this is pretty funny. Apparently, MLB.com posted a “Dodgers Tie Series” headline a bit early. If you are a Phillies fan, and you haven’t read this article, by the best baseball writer on the planet, then you need to. -The Howard homer in the first was great. They showed that statistic that Randy Wolf had given up one home run to a lefty all year, and the next pitch went out. Great start coming off the blowout on Sunday night. -You could argue that Blanton was affected by pitching out of the pen lately. He looked great for three innings, then looked very hittable in the 4th, 5th, and 6th innings. Not sure why Charlie let him hit in the 5th, but it’s just another example of Charlie wanting to avoid using his bullpen. -Speaking of the bullpen, lost in the miraculous ending was the fact that the bullpen, with Park, Madson, Eyre, and Lidge, put up three scoreless innings. That’s a good sign. -Matt Stairs has become well-known for saying, “I’m always looking to hit a home run,” which most hitters won’t say. I wonder if that helped get into Jonathan Broxton’s head in the 9th last night. Broxton had to have last year’s homer in the back of his mind, and pitching with a 1-run lead to a guy that is just trying to hit it out, you have to think he had some fear of putting one in the strike zone. -I loved a quote from Howard after the game. Talking about Carlos Ruiz scoring the winning run, Howard said, “I haven’t seen him run that fast since rookie ball.” It’s just a reminder that a lot of the guys on this team came up through the minors together, have grown as players and teammates together, and now they have a chance to win back-to-back championships together. Pretty cool. -Check in tomorrow night for a live blog of Game 5, as the Phils look to wrap up the series and take their second straight NL pennant!